30 Prizes are out for grabs on MobileRecharge.com Facebook page starting November 5, for all expats willing to send free mobile credit to someone abroad. MobileRecharge.com, the service dedicated to expats worldwide, starts celebrating World Top Up Day with a Facebook warm up giving out over 30 free top up prizes, before letting out the big surprise on November 10, 2018. Three Facebook contests take place each day between November 5-7, and all comments to the contest posts enter automatically a draw on November 8. Winners receive a free top up that takes seconds to send with MobileRecharge app or on the website. November 10 is the official day celebrating top up givers worldwide, in other words, all expats worldwide who support families back home with mobile credit. The event has been launched by MobileRecharge.com in 2015 as a sign of appreciation for all expats sending mobile credit to relatives and friends. This year too, a great surprise is being prepared for everyone visiting the website or using MobileRecharge app on November 10. The organisers will not spoil the surprise, but they invite everyone who want to save on their mobile recharges to save the date: November 10. Between November 5-7, everyone is welcomed to join and get a chance to win. There’s no competition involved. The 30 winners will be randomly selected next Thursday, November 8, and will receive a coupon to redeem their prizes. Anyone interested needs to pick a challenge out of the three contests between November 5-7, 2018. A simple comment is required to enter the draw automatically. The first contest starts on November 5 and the challenge is to answer the question "What makes you relax?" The hint is that MobileRecharge is evaluated by many expats using the service as "easy and relaxing". The second challenge starts on November 6 and the question one needs to answer is "If you could own any pet, what would it be?" The last chance to participate is on November 7, when the third challenge is launched: "Where would you go on an adventure?" Contests are a common way for expats to win top ups. Those interested in saving even more have 2 other alternatives: the Promotions page on the website (or the homepage of MobileRecharge app) that hosts daily bonuses. But also by subscribing to "Get offers" by email. 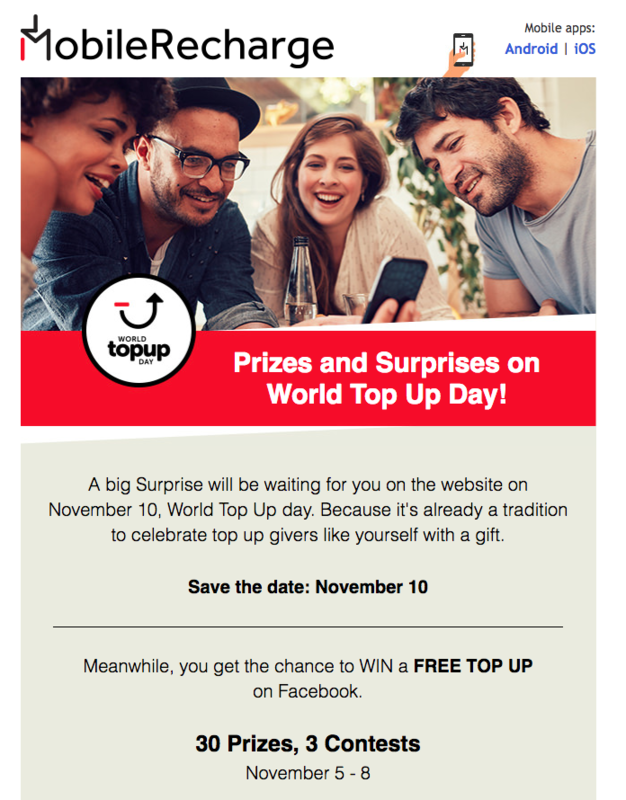 World Top Up Day - November 10 - Visit to get your Surprise!